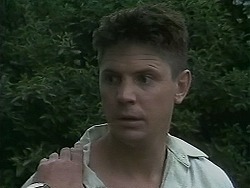 Helen tells Jim that she thinks Beverly may be suffering more from the loss of Rhys that they thought. 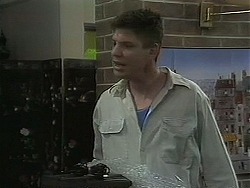 Lochie tells Kerry that she's selfish for wanting to move to the country because Joe and Toby don't want to. Melanie asks "Linda" if she likes Mel Gibson - perhaps she'd like to go and see his new movie with her? "Linda" is reluctant, but can't think of a good enough excuse, so accepts. Paul comes in and shows "Linda" photos he's got developed - he wants to put Linda's photos on the brochure. She looks alarmed but can't say anything. In the outer office, Melanie tells Paul that she's thinking of moving out of Des's - sometimes people can get on *too* well, she says. Joe comes in and tells Kerry that he's got a get-rich quick scheme - answering machines! He reckons he's going to flog them to the neighbours and make a fortune - he got them off a mate down the pub. Kerry says they can't afford to buy stuff like that, but Joe says the answerphone will pay for itself because it will be able to take messages about his business. He starts waxing lyrical about giving up his business. Kerry tells him he'll soon build up again in the country, but he does not look convinced. Des is hoovering when Melanie comes in. She tells him awkwardly that she's moving out. Des is confused - Melanie said she was glad to be settled for a while. Finally, Des realises that the problem is him - he can be a bit grouchy in the mornings, he says. Melanie says it's nothing like that. MELANIE: Des, I know how you feel about me and I'm flattered, honestly I am, it's not every day a nice guy falls in love with me. MELANIE: But, I don't feel the same way about you and I think it's great having you as a friend, I really enjoy it and I think that's how it should be, we should just be friends. MELANIE: You can see that it's not going to work, Des. I mean, me living here, you feeling the way you do. The last thing I want to do is hurt you. Des tries not to laugh. DES: Melanie...I'm not in love with you. DES: What...er...gave you that idea? MELANIE: You sure you're not?! DES: Positive! Was it something I said? MELANIE: No, it was something somebody else said. MELANIE: Well, this clairvoyant I went to told me there was somebody secretly in love with me! Des laughs and says the clairvoyant needs new tea-leaves. They are both laughing now and Melanie is relieved that she doesn't have to move out. She still wonders who the secret love is. Kerry comes into the living room to talk to Joe and Toby. KERRY: It's about moving to the country. I've been thinking what a big step it is to take. I mean, this is our home and all our friends and family are here...what I'm trying to say is that I've had second thoughts, would you mind if we didn't go? JOE: Are you sure mate, I mean you were so keen? Kerry tells him she's sure, although she's clearly upset at giving up on her dream. Joe tells her awkwardly that they all have to be happy, so if it's what they all want, they'll stay. When Kerry has gone to answer the phone, Joe and Toby celebrate their relief! Paul asks "Linda" to book Joe in for some odd-jobs next week. She wonders if he does private work too and if surprised to hear that Joe is (yet another) neighbour! Todd asks Joe if he's got any work to put his way. He's bored and wants to save more for his trail-bike. Joe says that he does have some weeding that needs doing at No.22. Todd tells Joe that there's a lot of gossip going around about "Linda". TODD: Well...Hilary reckons she's running a....house of ill-repute. TODD: Well, Hilary reckons she's seen guys going in and out of there all the time. JOE: Mate, Hilary Robinson wouldn't know what time it was in a clock-factory! A house of ill-repute - get out of it! TODD: What if she's right? Melanie is racking her brains as to who her secret admirer could be - it's not Des or Harold. Des is shocked that Harold was even in the running(!) He thinks the clairvoyant may have got things wrong, but Melanie is adamant that she is never wrong. Just then, Joe comes around and Melanie crosses him off her list too(!) He's come to sell Des an answering machine. Des says he doesn't need one, but Melanie says they are pretty good - particularly for messages from Melanie's secret admirer! Joe offers it to them for $80 and Des and Melanie agree to go halves. 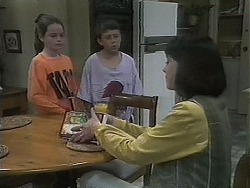 Toby and Lochie invite Kerry to play hide and seek, but she doesn't want to - she's not in the mood. She looks very sad, but tells Toby that she's fine. Paul invites "Linda" to a conference the weekend after next. She's alarmed to hear that it's the whole weekend - she doesn't think she can go. Paul is not impressed and tells her she has to offer more professional dedication. Joe and Todd chat about Melissa as they assess the job. They also talk about the "house of ill-repute" and Joe suggests that they look through the window for evidence - for example chandeliers and red curtains(!) Todd asks Joe how he knows about the inside of houses of ill-repute and he awkwardly says he's seen it in the movies! Joe looks in the window but can't see anything. 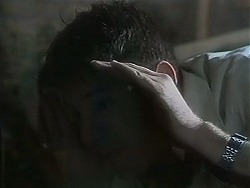 In the living room, Christina ducks behind a unit in terror. She calls Caroline and tells her that a man is looking through the window - she's nearly crying in fear. CAROLINE: Has he seen you? Caroline tells her to call the police and she'll be home as soon as she can. She asks Paul if she can have a few minutes' off to slip home, but he says she might as well take the rest of the day off as all the work is pretty much done. She dashes off, gratefully. Des is attempting to record an outgoing answer-phone message. Melanie thinks his message is very stiff and solemn, like he was an undertaker! She has a go and isn't much better, leaving a special message for her secret admirer(!) Des has another go but they dissolve into giggles. Todd and Joe are crossing the road with the lawn-mower but it's out of fuel. Todd goes to borrow some from Jim while Joe goes back to No.22. Meanwhile, the police have arrived at No.22 and Christina tells them what's happened, describing Joe as "tall and mean-looking". Hearing a noise, the police dash around the back of the house and confront Joe. POLICEMAN: Put the shovel down! But the policeman (who is in plain clothes) has got his badge out. POLICEMAN: We don't want any accidents, do we? He lowers his shovel to the ground.